So how do I create my first mobile survey form? Think of the form as a small document you are creating. It will have a name and it will contain various items and sections or what we call “components” in the document. These components can be composed of different types, ranging from simple text fields or multiple choice dropdowns up to setting your GPS locations be a and adding picture and audio files etc. , basically anything you would consider important for a mobile survey. When you are logged in, just click on “Forms” in the main menu. Then click on “Create New Form” and you will see your first blank form. The first thing to do is name your form. 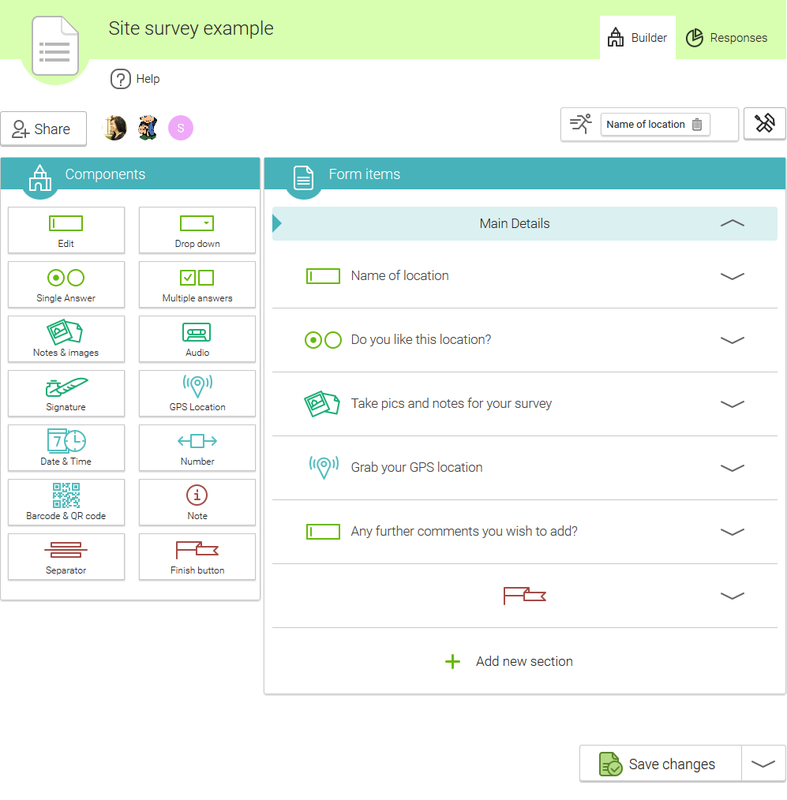 Then you can create sections, drag the components you require for your survey form. Afterwards, just edit the names of your questions. Some questions allow you to change additional features as well (eg set the answers for the single answer component). 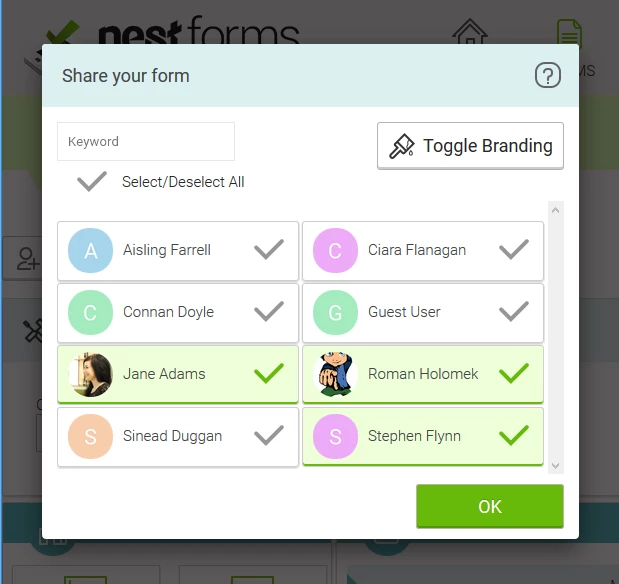 You can then share your newly created form with your friends within NestForms. Just save the form and your newly created form will appear when you login to the mobile application. You can also drag items up and down by dragging them wherever you need them to appear on the Form itself. Clicking on a component within the form allows you to edit the content and some of the features of that component in the right hand column of the page. You can share your form with your friends and coworkers. When you click on the “share” button, the “Share your form” window will open. This window contains all of your “Relations”. You can select the people you wish to collect data from, by just clicking on their names. Once you are done, click OK and all selected members will appear as small icons beside the share button. When you save the form, all selected members will see the form in the app and they will be able to begin collecting data instantly. If you would like some information on adding new relations to your form, see the Relations help page. There are also several advanced options like choosing a client, prefilled title and setting your form branding if you are interested. Saving is done by clicking "Save changes" button in the right bottom corner. There are other options of saving your survey forms which accessible through arrow on the right side of the "Save changes" button. "Save as New" will create alternative copy of your survey form you been working with and leave original unchanged. 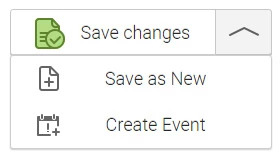 "Create Event" will save form and create event from this form as well. For more information about Events check our help article regarding Events. Below is a screenshot of the main Form builder interface to allow you to get your bearings. If you have simple form with just a few questions, you do not need to care about creating sections. However when you have a more advanced form, you might want to break the form into smaller areas, which we call sections. This makes it easier for your associates to perform the survey as they will be filling in separate smaller slides that are easier to read and fill. Remember also you can edit the section names to whatever title you choose as well as being able to rename the components. Text - Allows you to enter free text (either one line or multiple lines). Single answer - Or “Radio Buttons” if you prefer to use the technical term. It allows the end user to choose one option from a small list of choices. All of these are visible (suitable for small choice lists like yes, No, I don’t know). Multiple Answers - Similar to the single answer option except it allows for multiple selections. Dropdown menu - Only one option is selectable, but this is suitable for longer lists. Audio - Allows you to record a short audio file. If for example, the response is more than 100 words. It can be easier than writing the comment itself. Signature - Opens up a drawing board which allows you to make signature using touchscreen. The signature is then saved as an image. Dates and Times - For creating a timestamp for the survey or selecting dates manually, options are to enter the date, time, or date and time. Note - This is passive information that can be viewed by the user performing the survey via the app. It is for informative purposes only, for example, explaining some details of the form if necessary. Horizontal separator - Used just to separate logical blocks of your survey or questionnaire, helps to break up the presentation of your form. Autocapture - Allows you to automatically fill in certain data into your Responses (eg: the name of the Responder, Date & Time, IDs etc.). Feature button - The Finish button is the last button that the user normally clicks on when their data entry is finished. When you select the “Finish & new” option, it speeds up the process of starting a new survey. To create your Form, you just drag and drop a component from the “Components” section on the left and drop it into the Form items section in the middle of the page. If you already have forms or would prefer to create your forms in Excel, you can also achieve this with NestForms and then import your excel file into your NestForms form. See more in the Excel form import help page.